Just one amazing flowers and generations of certified herb .. elderberry. You know its multifaceted healing powers? Do you know how to use it? Can you prepare the syrup from the flowers? Elderberry is one of our most popular herbal folk medicine. Its shrubs with us can be found nearly everywhere, growing on hillsides and forest edges, in fields and meadows, parks, roads etc. with blooms in late May and June and the fruits ripen in September and October, which is recognized by a distance number of birds who like to organize mass raids on bushes laden with dark purple fruits .. Which parts of the elderberry are healing? The answer is: all. This shrub can use for therapeutic purposes really whole, both young spring shoots and flowers, bark, leaves and root with the highest concentration of active ingredients. The easiest way is for us, but surely gathering flowers and fruit, or leaves. Leaves and immature fruits contain slightly toxic substances, so they do not use internally. Flowers and cooked ripe fruits are best suited to the contrary, internal use. We have produced various syrups and soda or tea prepared from them. Flowers can even adjust like soup, or fry like pancakes. The fruit is commonly produced earlier jam and pickles, can be added into the jam and fruit purées, or of them can produce excellent elderberry liqueur and elderberry wine. Leaves are traditionally used mainly for the treatment of joint problems such as tiles on the affected parts, like roots from which it is produced extracts and infusions. Now is the time elderberry flower .. let us see, therefore, how best to collect flowers and customize for internal use, since this herb could for his versatile and powerful healing effects certainly not escape our attention. For drying collect a fully blossoming flowers, and ulamováním or odstřiháváním of branches. Susie is either spread out in a thin layer, or flowers hang in a well ventilated room. Storage for later then remove any browned flowers, leaving the only drug that has kept a light yellowish color. Are stored in closed containers in dark dry. Dried flowers we use for tea. Elderberry in folk medicine has earned the respect of the treatment of colds and respiratory illnesses such as influenza, tonsillitis, bronchitis, cough, rhinitis, sinusitis, and so on. Stimulates perspiration, which can reduce the temperature and helps us to get rid of mucus in the airways established ways improves expectoration and eases breathing. For this purpose we can use as a tea, either alone or in combination with eg linden blossom, coltsfoot , mullein, nettle , nettle, plantain and below. I syrup of the flowers is the right medicine, prepare it with lemon juice, served the sick, we can also use a teaspoon several times a day, or add it to tea. Elderberry flower has a cleansing effect on the body. It helps us get rid of toxins established, especially uric acid, thus treating ailments such as rheumatism and gout, or it is an excellent prevention of these diseases. Likewise, we will help in case of problems with the urinary tract and kidneys, such as their lack of activity and renal and urinary calculi, has diuretic and clean from debris. Even with excessive fluid retention and swelling is advisable to drink tea from elderberry syrup or use. Healing effects elderflowers appreciate those of us who suffer from blood pressure problems and vascular diseases. Without improves elasticity of blood vessel walls and lowers blood pressure slightly. Cold unsweetened tea from the flowers is a great remedy for stomach problems as well as stomach and intestinal colic, flatulence, nausea and slow digestion, lack of activity or the gallbladder. 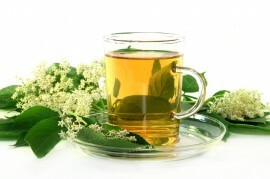 Elderflower tea or syrup added to beverages has a slightly laxative effect, can make life easier for us, therefore, if we suffer from constipation. An infusion of elder flowers can be used for cleaning and washing sensitive skin which reacts to an allergic unfriendly chemicals. Prepare a pickle as well as tea and gently wash the face or other parts. procedure: lightly showered flowers free from the strongest parts of stems, pour boiled water, add washed and sliced ​​lemon (or citric acid) and let stand for 24 hours. Then strain through a fine cloth into a pot, add the sugar, stirring to dissolve thoroughly, simmer briefly and fill into bottles. - The prepared syrup last if stored in a dark cold room for several months, eventually. it can be 10-20 minutes. sterilized at 80 ° C. After opening the bottle with syrup instead are stored in the refrigerator. Perhaps if you did not believe in the healing power of elderberry, try the magic .. Bunches of us elder said to protect against witches, evil spirits or flash .. according to their own personal experience, however, strongly believe that more active ..